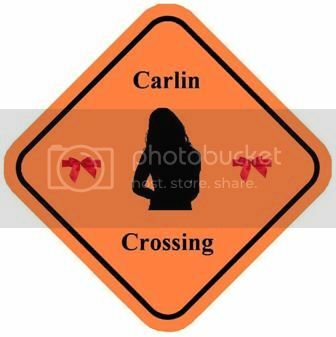 I wanted to take a shot at making something so here is a new crossing sign. Special thanks to those that made previous signs as they were excellent templates. Let me know what you think. Thanks. I like that idea, I'll see what I can do. Very good, Bill. I have coined a phrase with her that she liked in Vegas. I told her I had been Carlinized. Mike suggested that comes from a mineral, Carlinite, so perhaps Something like "Warning, Carlinization in progress" or "Carlinite loading zone"? I like the added ribbons! BTW, we have a design for a button and will get some ordered in time for Mike to deliver some to the M & G on the 5th. Anyways, back to topic: I think I actually like it better without the ribbons. You wouldn't really see a real street sing displaying a ribbon, would you? To make it individual, maybe try a different background color? Light green perhaps, to stick with the Irish theme (even though it wouldn't really look like a proper sign then either, I know). Yes, we need to revise the Celtic Woman periodic table of elements and actually make one up. I have them all assigned. Non-toxic unless you actually ingest it. Another idea is that MC has joked about people calling her Mermaid. So, perhaps one with fins and call it MerMairead crossing? Oh, yes, FA, I was Carlinized before I even got to the show. I joked about it with her on Twitter days before after viewing her YT videos. I walked up to her night one and said I was ready to be Carlinized. Her eyes got wide and she said, "I know you!". The symphony show really does a good job of highlighting her range. Can't wait to see what she gets for spring.